....A Fresh approach to Commmunity Management. PMA is a different kind of management company. We work from the Community's perspective. We understand that the Board members volunteer their time, and that their time is precious. We respect that. Everything we do is about creating efficiencies. We do the leg work, keep things running smoothly, and provide the information necessary to enable the Board to make smart, informed decisions. 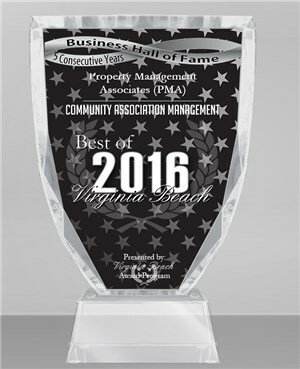 PMA has been honored with winning "Best of Virginia Beach" in Community Association Management for FIVE ﻿consecutive years! Give as a call to see what makes us the Best! What sets us apart is that we listen.... and then we do what we say we are going to do. We take the time to consult with the Board to gain understanding & perspective before preparing our recommendation. We present options to the Board giving them the flexibilty to select a solution what works best for them. Contact us today for a FREE customized solution tailored to your community's needs. Recognized as a leader in Community Association Management for four consecutive years!